Even if you have perfect vision on land, don't be surprised if you experience blurry vision underwater without the use of goggles. Goggles provide a protective shell around the lens of your eye, enabling you to see crisply and clearly while swimming. If your goggles leak unexpectedly while swimming, you might experience eye irritation and vision distortion. Rather than living with the irritation and emptying the lenses every few minutes, proactively work to eliminate leakage. Inspect your goggles for disfigurement such as bent or kinked frames. If you notice something odd, place them in boiling water for five minutes. Allow them to cool for a minute or two; while they're still warm, press them into your face to remold them to a shape that better fits your face. Store goggles in a hard case to prevent them from getting bent or disfigured. Disfigured goggles often become leaking goggles. Adjust the strap and nose piece to your head so that no gaps exist between the seal and your eyes. If you tighten your head strap too much, you actually might cause more leakage by pulling the eyepieces away from your face. 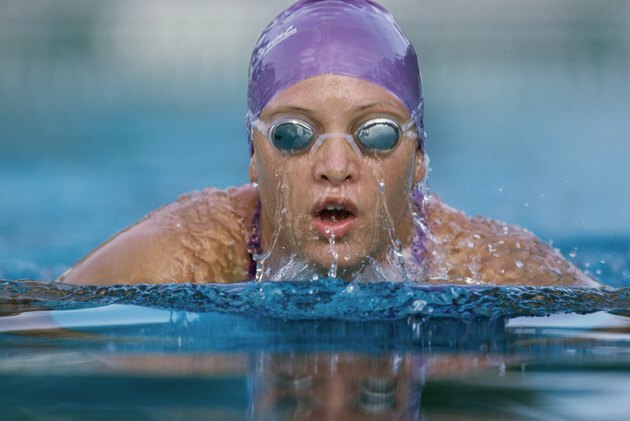 Suction the goggles to your eyes before you begin swimming by pressing them hard against your face. This will help prevent leaks around the edges. Work on keeping a neutral facial expression. Making faces or squinting your eyes while swimming with goggles can cause your eyes to crinkle around the edges, your goggle's seal to break and water to leak in. This might take some conscious effort, especially as you start tiring during your workout, and you might unconsciously make faces as you strain to work hard. Replace goggles if they show signs of wear. With use, even the best pair of goggles can start to lose their seal. Clean your goggles regularly after using them to wash away any chemical residue that could break down the goggle material more quickly. You can use toothpaste to clean your goggles. Purchase goggles from a swim shop and ask the clerk for help choosing a pair of goggles that will fit your face. If you are buying goggles for children, expect to replace them regularly. Children's bodies are growing and changing, so even if a certain pair of goggles worked six months ago, they might not fit anymore. Over-tightening your goggles to create a tighter seal might work temporarily but could lead to headaches. You shouldn't need to over-tighten the right pair of goggles for your face shape.